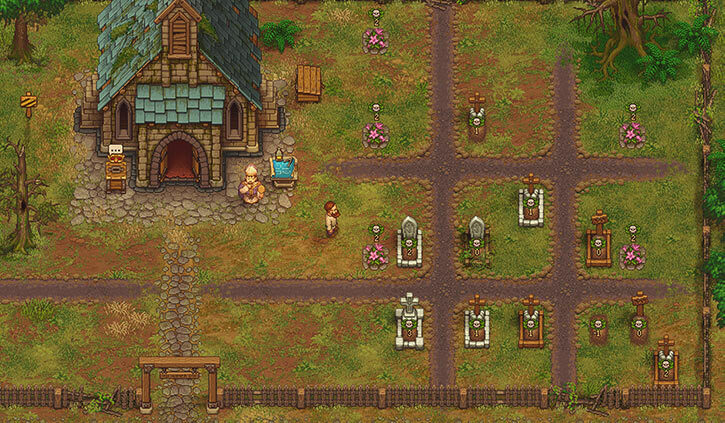 Graveyard Keeper is a build-and-craft game, with some question, dungeon explorations, mysteries and the like on top. It was released in August of 2018, though polishing until September wouldn’t have hurt. Writeups.org is an encyclopaedia about fictional characters (mostly comics and games). But we occasionally do a small guide, just because. 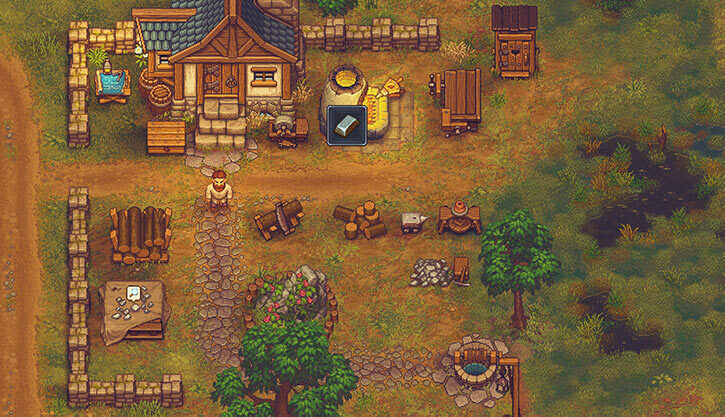 Do not assume that this game works like other games, such as Stardew Valley. There isn’t really a fail state. If you miss a character, they’ll be there next week on the same day. Do not assume that resources you need will unlock soon. They could be much work and time away. The first day doesn’t offer much choice. Follow the events, read the explanations. You still have some time and energy to use up the repair kits at the graveyard, clear the brushes and rocks in your graveyard and in your home’s work yard, but that’s about it. Talk to the ghost as you wake up, don’t act on this right now. Read the placard in your garden, South of the house. Go to the village. On your way, pick about 15-ish red flowers. Go to the inn. Talk to Ms. Charm and the poet, talk to the innkeeper about your garden, the meat, the certificates, etc.. Sell the certificate but don’t buy no beer. Give the blacksmith the letter, ask about ore, fight the slimes, get your reward. Buy two more simple iron parts using your certificate money. Check with the innkeeper before returning. On your way back, go to the Southern building at the wheat farm. Ask about being a farmer, and buy 16 crop wastes. Return to your garden, talk with Gerry. Pick some berries, invest 10 green in the agricultural decay technology. Create a heap, and launch the process. With the remaining energy and time, harvest some wood and rocks and bushes. With your simple iron parts, and what you harvest from your house’s cellar (don’t forget the recipe in the chest), you can fairly quickly lay out the basic tools : sawhorse, chopping spot, furnace I, wooden anvil, carpenter’s table. To avoid running out of space too soon I put the furnace in the upper zone, then next to hit the carpenter’s table (rotate it once by hitting “R”). The rest can be grouped in the lower zone. You’ll need a lot of wood. The priority is to hit the medium-sized trees nearby, *and* shovel out the stump. They’ll regrow eventually. Just North of the house there’s a swampy area that once was a river bed. It has iron ore, which you’ll want to thoroughly mine. From there always have your furnace smelting iron. This is a slow process, so you need to pump out ingots for all those nails and parts. Early workyard, with the furnace and carpenter’s table at the top and the rest in the middle. The furnace is running (it is *always* running) and the yard tree should be chopped down soon so it can start regrowing. Click for a larger version. Early on, energy isn’t much of a problem. With proper organisation, a day’s work and your energy bar will coincide. At worst, you can take a short nap. You’ll eventually want to have a second chest in your work yard. Say, after you free up some space by removing the sawhorse once it gets obsolete. Once you have enough iron, building better tools will help with energy. It also means less wear on your grindstone. Once the grindstone is gone, it’s less expensive to build new tools than repair worn ones. Keep cranking firewood out for that furnace to run 24/7. Keep sticks for when you’ve run out of both energy and ready firewood, but want to smelt something while you sleep. Both the table and oven in your house’s main room are workstations. Baked mushrooms are an easy, convenient source of energy. It is easy to bring the graveyard to the strategic 5 points of quality in the first week. With stone, your red flowers and the peat from the compost heap, you can create nice flower beds. Exhume the corpse with the nasty red skulls the ghost told you about, that’ll help. Work on it (we’ll talk about that soon) , carry it West to the river, dump it. Gerry will then tell you about cremation. At this point, getting the wooden grave markers and borders technology will allow you to build a few of those, and get to 5 in time for the next Pride day. After the sermon, check the church’s basement. There are some resources to harvest. Wake up early and energised. Talk to him, get the quest, buy the Clay technology. Immediately get to the clay spot just South of the graveyard (the hole in the ground), shovel seven clays. Get to your yard, build a potter tool, spin 21 bowls, run back to the Bishop. Get the rewards, and do another mediocre sermon. You can craft 7-ish wood repair kits and 4-ish stone repair kits to repair what’s not fixed in the graveyard, it’ll pay off. This “starter graveyard” has a quality of 20. No additional corpses are in. I’ve simply cleaned and repaired what was already there (crafting a few additional repair kits), laid out flower beds, and exhumed the bad corpse. Click for a larger version. You know have 5 blues from his handbook. You also can harvest sand – just run North along the river just West of the graveyard until you see the big sand pile on the shore. Sand isn’t important in itself at this stage, but turning it to glass in the furnace yields one blue point. Keep churning glass out to earn blue. The technology to build church benches. With four in place, your church rating will allow the casual prayer to succeed 90% of the time, which is a strong gain. The cremation technology. More about that later. I’d suggest producing more glass (always keep your furnace running) to buy the Woodcutter technology. It’s a good quality-of-life perk. Upgrading to the big church has a *big* hidden cost (20 silvers), that locks you out from sermons. So make sure you have an *extra* 20 silver after upgrading. Unless you love “ah ah, gotcha sucker” moments at your expense, obvs. The corpses are an important natural resource. Notably, the certificate are a huge part of your income early on (though the inn won’t be able to pay for them forever). From your second corpse onward, you want to harvest them. The first two technologies to do so are cheap (the third is more specialised), and the material stacks. Skin, in particular, is important since it allows for paper-making. And working on corpses is a solid source of green points. Early on you won’t be burying them. You need resources from them, so they’ll have a *lot* of red skulls. Instead you’ll burn them, which is why we rushed the cremations technology. Yes, it’s a lot of wood, but it pays off in valuable certificates. Once you can work on corpses and burn them at a decent pace, expending the morgue to a capacity of three is a good move. As you’ll see, processing corpses also requires… carrots. The donkey will excrete 12 seeds, which is sufficient to work three garden beds. Just remember to always put a piece of peat first, before the seed. While the peat is self-sustaining via your compost heap, you’ll gradually run out of seeds. Buy some from the farmer to keep churning enough carrots to get your corpses. Hearts, brains and intestine are useful, but they do not stack. You could fill your cellar chest with those, though. Make a lot of paper. This requires building a new workstation in the church’s basement. Even small quantities of skin produce a lot of paper. Convert an entire stack (50 pieces) to Science points at the study table. Get 15-20 Faith from sermons, now that they almost always work. Buy a cherry pie at the inn during a village trip. The one that increases the effects of studying. Fill your bag with every type of corpse byproduct (blood, bone, fat, meat…) and a few basic graveyard supplies (wooden marker, wooden cross, wooden border…). Note how all these items tooltips say that studying them earn blue points. Once you’ve reviewed how studying stuff, have your items, your Faith and your Science points, eat the pie and start studying. By the time your Faith points and pie buff run out, you’ll have more than 200 blue points. Get the tech to build confessionals in the church. A pair of confessionals make your sermons much, much more efficient. But doing that many planks and nails takes a while. Review the various perks that increase output with ore, with furnaces, etc.. The bluesplosion allows for taking them fairly early, and you have enough of those that it’s now *red* points that you need to focus on. Unlocking the stone graveyard ornaments (*and* the stonecutter II table) is a fine investment. Building these earn blue points. By then, you prolly have realised how to turn corpses with few red skulls into nice corpses (remove the fat and blood, touch nothing else). These 6 white skulls corpses are right to benefit from stone and engraved stone graves. So you now have the means to greatly boost your graveyard rating, by pumping out nice corpses in nice graves. This means your sermons will earn way more. Which is good, since other resources (such as vendoring) tend to taper off. The circular saw tech allows for building beams. These unlock some important content. However, I think that doing planks at the carpenter’s table still earns more red points. And note that you may need to expand your work yard once you go past the early workstations. It might seem tempting to beeline for, say, better church benches. But not how the tooltip says these need silk… This is a good example of not assuming that if you can get the tech, surely the components can’t be far off. Because silk is quite far off. Clearing the stoppage at the back of your house’s cellar opens an underground shortcut to the village – the Eastern tunnel. It saves time, which is good. Especially when going to the lighthouse. Repairing the Western bridge opens the swamp. It has more iron nodes, plus the white herb for the Merchant, plus the witch. The swamp seems impassable at first, until your start visualising the paths of solid grounds. And from the witch’s place, you can build a bridge (requires a beam and much energy) as a shortcut. Wooden beams also allow for clearing the blockage between the house cellar and the church basement (and the path to the witch). These are decent quality of life improvements. Clearing the way to the morgue is less interesting. The deal with the merchant is a good early objective. It encourages you to run that garden. Always put in peat first, and keep in mind seeds don’t quite naturally renew. And it means that buying your citizen’s licence doesn’t come as a sucker punch, but as part of a plan. The Inquisitor’s quests is easy once you can buy the tech to make flyers. It opens an important revenue source and new industry. There are more overland blockages to the Northwest. One of them opens the quarry in the small mountains. This’ll be an important source of stone and ores once you’ve mined the graveyard vicinity and the swamp.